Chitra was brought up in a environment steeped in rich and vibrant South Indian culture. Her family have always been appreciative of arts, music and dance. Her talent was nurtured from a tender age of 8 by her supportive family especially her mother who continues to encourage her to strive for excellence. Chitra has blossomed in to a skilled and accomplished dancer due to her untiring efforts. She has carved a niche in the field of Kuchipudi dance. Chitra started her dance training from a tender age of 8 years. She is a disciple of Guru Smt P.B Krishna Bharathi. She has continued her passion for Kuchipudi and obtained her Masters degree in dance from Central University of Hyderabad, India. She continued her higher studies and obtained MPhil in folk arts from Telugu University of Hyderabad,India. She is an acknowledged Kuchipudi dancer and a “Graded Artist” in the dance artist panel of Doordarshan Kendra,Hyderabad,India. 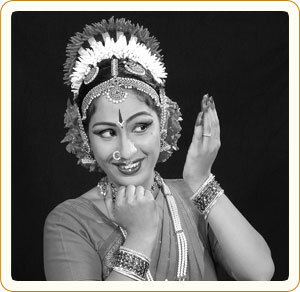 Chitra has perfected Kuchipudi dance with her experience, knowledge and dedication. She has mastered the technique of emoting very fine feminine expressions,with the perfect rhythm while maintaining the necessary grace,gaiety and poise. The art of choreographing very difficult “keerthanas” (songs) and ballets with the masterly speed of motions with grace is her forte. She has performed at events organised by various prestigious organisations in India, Dubai and UK. Her solo and group performances have held the audiences enthralled and won her appreciation and critical acclaim.